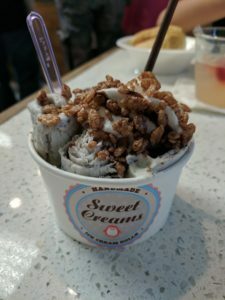 Another ic e cream trend is landing in Honolulu with the arrival of Sweet Creams. 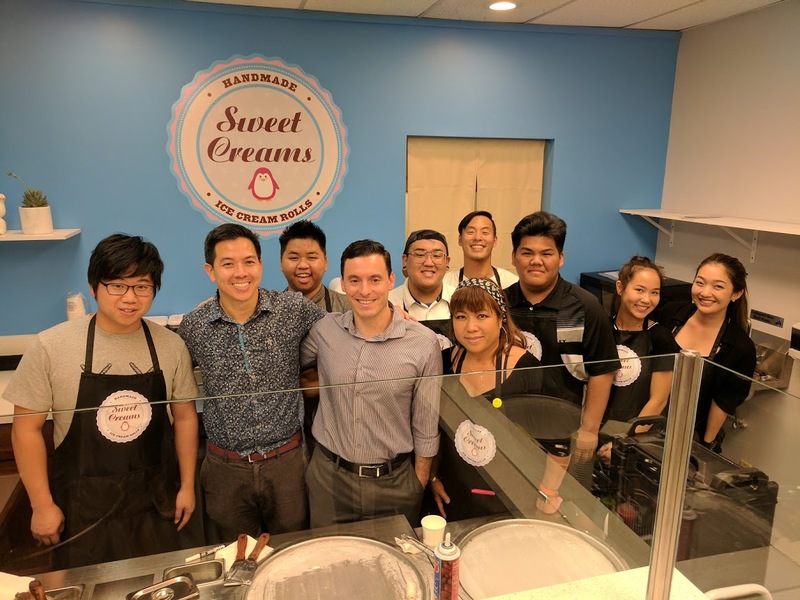 Sweet Creams held its Grand Opening at 1430 Kona Street (next to Ala Moana) today, advertised as the first ice cream store in Hawaii dedicated to serving the popular ice cream rolls that originated in Thailand and has recently caught on in places like New York City, Los Angeles and Boston. Rolling out flavors such as Strawberry Shortcake, Cookies ‘N Cream, Frozen Hot Cocoa, Pineapple 5-0, and Love You So Matcha, these desserts start with a specially crafted, liquid ice cream base poured onto a pan cooled to around -22 degrees Celsius. Fresh fruit, cookies, candies and more are chopped and woven into the liquid base as it begins to solidify in front of you. After a minute or two, the ice cream is smoothed over the pan, quickly scraped into rolls, and topped with even more fresh ingredients. Customers can also choose custom flavors. With the encouragement of several enthusiastic patrons, co-founders Jeffrey Kao and Bari Carroll – both born and raised in Hawaii – decided to open a store within the first year of business despite having full-time jobs. “We’re doing a lot of interesting things and are excited to roll out new twists as we move forward. The response has been unbelievable so far,” Carroll added. Sweet Creams will be open daily from 12pm to 9pm at 1430 Kona Street, next to Manichi Ramen and the main bus stops at Ala Moana. 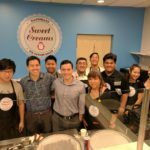 Sweet Creams is the first ice cream store in Hawaii dedicated to the popular ice cream rolls craze that originated in Thailand. Using fresh, local fruits and ingredients, we offer a unique ice cream treat in a fun and exciting way. No freezers needed! Each ice cream roll is handmade in front of you and provides a unique and entertaining experience. We look forward to having you try our exciting new take on ice cream – from Hawaii, for Hawaii! For more information, visit sweetcreamshawaii.com or our store at 1430 Kona Street, Honolulu, HI – open daily from 12pm to 9pm. This entry was posted in Restaurants, Updates. Bookmark the permalink.